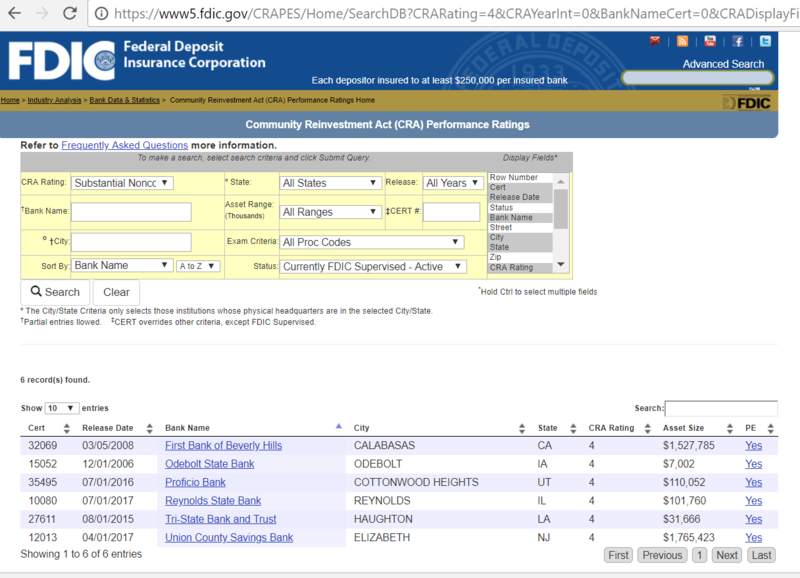 The Community Reinvestment Act (CRA), enacted by the United States Congress in 1977 is intended to encourage depository institutions in the USA to help meet the credit needs of the communities in which they operate. Congress passed the Act in 1977 to reduce discriminatory credit practices against low-income neighborhoods, a practice known as red lining. To enforce the statute, federal regulatory agencies examine banking institutions for CRA compliance, and take this information into consideration when approving applications for new bank branches or for mergers or acquisitions. Having key executives working with local non-profits may qualify as a CRA Community Development activity, depending on the organization and the nature of the service. The OCC notes that “providing technical assistance on financial matters to non profit, tribal, or government organizations serving LMI [low- to moderate-income] housing or economic revitalization and development needs,” may qualify as Community Development Services. Educating young people in financial literacy is an important goals of Community Development. Financial institutions may qualify for Community Development credit by establishing school savings programs, developing financial education tools or teaching financial literacy curricula for LMI youth. The Brookings Institution notes that the motivation for this is more than just educational. Particularly when working with high school students, this education and even access to credit products can help them establish a credit history as they’re entering the workforce. They note that it can be a great source of new clients. In this education, some regulators and industry think tanks note that education should emphasize the importance of saving and wealth-building. Some recommend Individual Development Accounts (IDAs) as a great place to start. Small businesses in LMI communities need support and access to credit as well. One way that financial institutions may strengthen their communities and gain Community Development credit is by offering entrepreneurial training. Like youth education, this training both helps support small businesses and may be a great source of new clients. The act and the administration of it serve as a very useful locus for regulators worldwide and their interest in ensuring that banks support their communities. The Royal Commission into Banking in Australia would do well to use the CRA as a lens upon which to evaluate the banking industry broadly. For those banks and credit unions within the purview of the CRA there would also appear to be multiple opportunities to seek compliance and competitive opportunities. In a recent meeting with one of the main US banking regulators we discussed the potential for financial literacy programs, particularly Chore Scout, to assist banks attain credits. The regulator indicated that there was good potential for banks to demonstrate that helping LMI communities in a range of activities, including the delivery of programs and platforms such as those Moroku provide, to accrue credits in this important element of a sustainable banking system and in turn, a robust economy.